The Kitties have been fighting over the best spots in the house, as usual. Grumpy often wins. If she does not win, she might arrive to sit on my lap. I love watching the Tinykittens feeds. Usually I have one running in the background so anytime I feel the need, I can flick over for a kitten fix. If I am going to be there for a while, I usually hit the full screen button – highlighted above in the image – as I find the chat and chatters can be somewhat annoying at times, especially when they start talking politics. Hey, these are kitties, look at them, forget Combover Man! There is an option to hide the chat but it pops up little boxes with new messages which is even more annoying. My favourite cat in recent times has been Skye, she is just such a character. 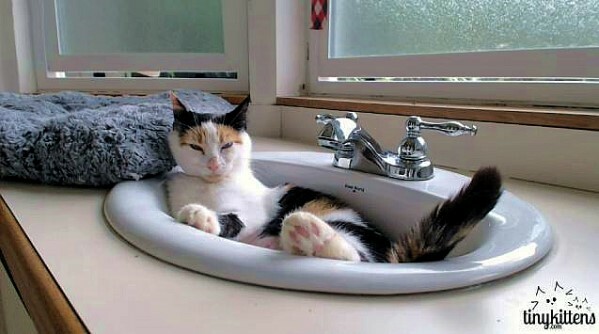 She loved the sink in her room and spent a lot of time sleeping in there. 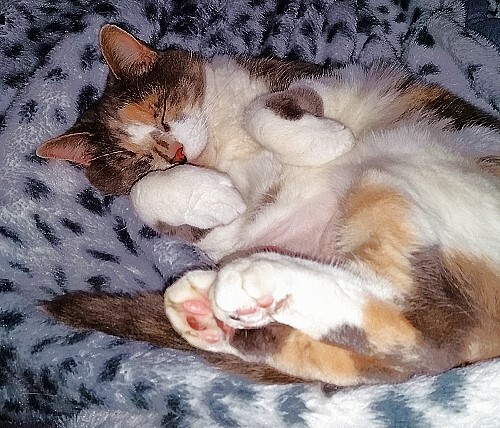 Once Skye was spayed and had raised her kittens, she went off to a lovely new home. They have a Facebook page! Right now they have a cat who they believe is a sister of Skye called Starling. She has the most gorgeous blue eyes and is coloured like our Grumpy. I saw her kittens born live on camera. I saw their eyes open. Two of the kittens are grey, orange and white like our Grumpy and every day they get more and more beautiful. Bear in mind, I am not the only one watching Starling and her kittens when they are on my screen. Grumpy can see them and will quite often park herself on my lap – I tilt the screen to the right place for her position, and she watches kitten teevee. 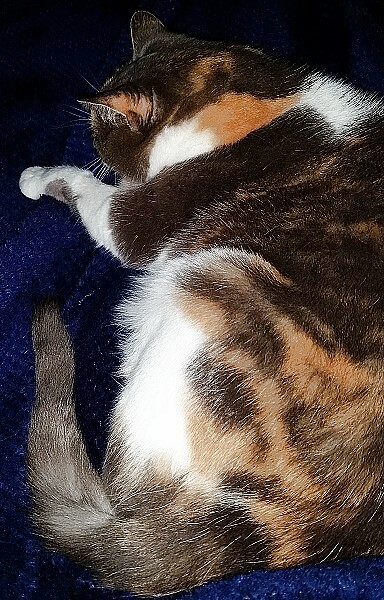 Sometimes my lap is not close enough to the screen for her, and she tries to sit right in front of my laptop, planting her paws on the mouse pad or keyboard, pressing random keys as a surprise to my computer. 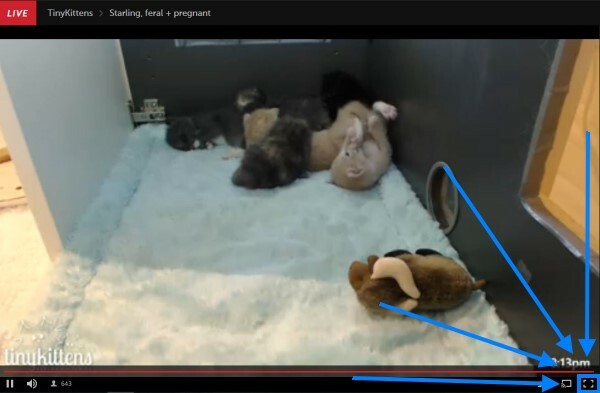 You – and your cats, dogs, chickens, or other pets – can watch the Starling live stream here. You can visit the TinyKittens Facebook page here, and also you can read more at the TinyKittens website. I love live live the tiny kittens feed! Saw it for the first time while home from work last year. Adorable. And your kitties are too! I didn’t know about these sites. Thanks for the information. 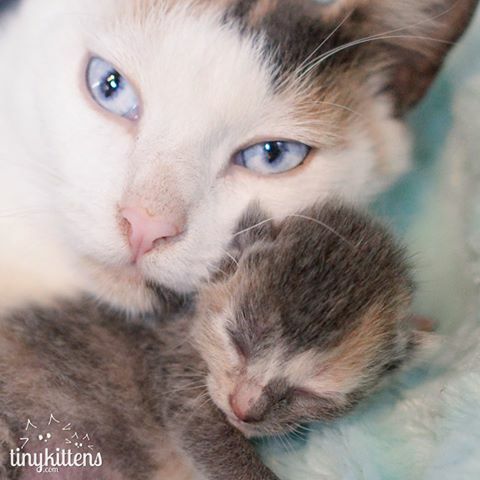 How wonderful to see the kittens born and open their eyes. They are all beautiful. If I start watching that website, I’ll never stop! Right now, I’ve got my boy Dudo on my lap. After being without us for 7 weeks, he has decided to be my shadow 24 hours a day. I love being loved. 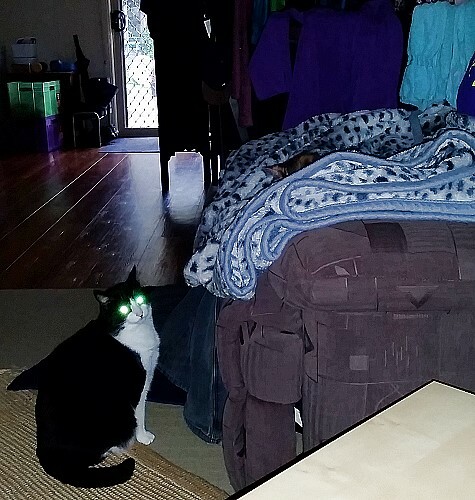 My kitties are not exactly fighting over their favorite spot – just when one vacates it the other claims it. Each of them stop and check out whether the other is in the bed. Zoe occasionally jumps up and pushes her way in. Charlie may share or give up and move. They are such fun to watch. Your kitties are gorgeous! I would get lost for days in the Tiny Kittens feed, I just know it.